If you’re like a large percent of people in the U.S. you’ve admitted to using a device during the hour before going to sleep. If you’re among these nighttime technology-users, you may not realize how much harder that makes it to settle down to sleep. It has been proven through multiple studies, that using smart devices before bedtime can be physiologically and psychologically stimulating in ways that can adversely affect your sleep. How Does my Smartphone Affect My Sleep? Here’s what happens: Using TVs, tablets, smartphones, laptops, or other electronic devices before bed delays your body’s internal clock (a.k.a., your circadian rhythm), suppresses the release of the sleep-inducing hormone melatonin, and makes it more difficult to fall asleep. The more electronic devices that a person uses in the evening, the harder it is to fall asleep or stay asleep. Besides increasing your alertness at a time when you should be getting sleepy, which in turn delays your bedtime, using these devices before turning in delays the onset of REM sleep, reduces the total amount of REM sleep, and compromises alertness the next morning. 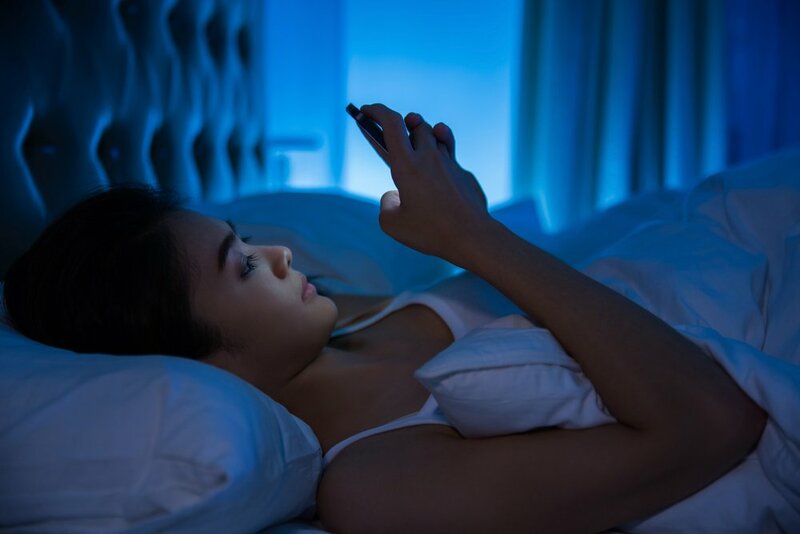 Some devices, websites and apps have responded by offering “night modes,” which shift the device’s light output to redder ends of the spectrum that may be less stimulating to the eyes and brain. Despite these efforts, some people still report continuing to notice increasing sleep issues. If you want to go device free at night completely, one good substitution is reading. Reading a printed book under lamplight (as opposed to bright overhead lighting) is a great choice. If going device free, cold-turkey isn’t realistic for you, try setting a shut-down device goal. Set the goal of shutting down at least two hours before bed. One tip to get to that goal is to start with 30 minutes before bed for a week than down to one hour before bed for the next week. By the third week, you could be at the two-hour before bed goal. Watch how much better you sleep at night. Still Having Sleep Issues in Glendale, AZ? If you find you’re still having sleep issues, it’s time to look at what pillows you’re using and what sleep habits you have and if your mattress works within those sleep habits. To learn more about using the proper pillows and mattress, come in and talk with one of our sleep health experts at Mattress360 in Glendale, Arizona.